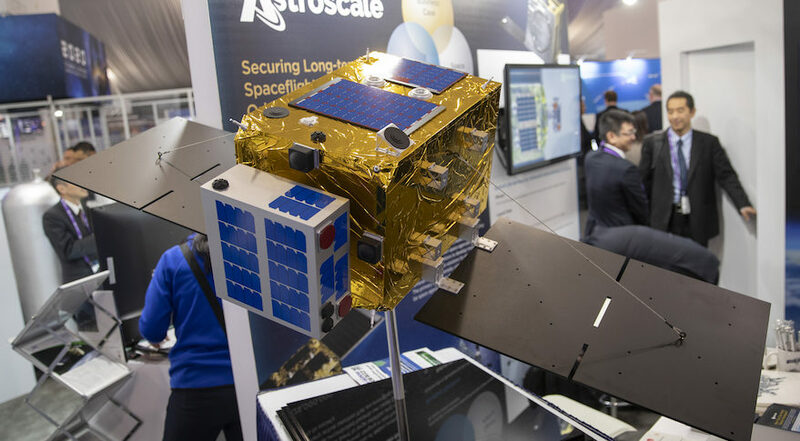 COLORADO SPRINGS — Astroscale, the Japanese company developing technologies to remove orbital debris, announced April 10 that it has raised an additional $30 million and will open an office in the United States that the company hopes will lead to new business opportunities. The Tokyo-based company announced at the 35th Space Symposium that it added $30 million to an earlier $50 million Series D round the company raised in October 2018. Several Japanese funds participated in the round, including some who previously invested in Astroscale. The new funding brings the total raised by the company to date to $132 million. Astroscale is currently working on technologies that would enable active debris removal as well as end-of-life disposal of satellites. Its next satellite, called End-of-Life Service by Astroscale demonstration (ELSA-d), is scheduled for launch in 2020 to test technologies to identify, approach and capture objects in orbit, using a larger “servicer” satellite that will track and dock with a smaller client spacecraft. ELSA-d would lead to later operational spacecraft, although Blackerby said the specific missions and scheduled have to be worked out. One issue is uncertainty about who the customers of that service would be, which could include government agencies and companies operating satellite constellations. The additional funding, he said, gives the company more time to see how those potential markets develop. Astroscale will also use the new funding to open a U.S. office in Colorado. That office will be led by Ron Lopez, who previously led defense and space sales in the Asia Pacific region for Honeywell Aerospace. The company chose the Denver area for the office because of the region’s existing space industry base and access to both financial and educational institutions. The area also won out over alternatives like Seattle and Silicon Valley because of support from local economic development offices and lower costs. A drawback, he acknowledged, is the complications that export control regulations introduce for an international company like Astroscale, which also has offices in Singapore and the United Kingdom.